Some skiffies are madly sanding, fairing and painting into mad hours of the night and all weekend. Others walk past their charges on the way to work, brush leaves off the tarp (those boats lucky enough to have one), and get in their cars and drive off, with nary a thought to going sailing. Yes, it’s mid August, and the sailing season opener is a scant 3 weeks away! For those who get on Facebook or Twitter, you’ll notice that this twit forgot to disable the feature that tweets when events are added or changed, and there was a bunch of announcements posted (slowly deleting them!). All of our race events apart from the kiteboarders have been uploaded into our website event calendar, and you’ll see then next five events just to the right of the posts. First racing is the Opening Day on Saturday September 6th – it’s a no points race day for those of you still still sanding and painting your boats, but if it’s ready we’d love to see you all there to wash the spiders out of the masts and booms. Most importantly, one of the early events we have scheduled is a Rescue Boat Induction and Training session. It will be held on Saturday 13th September at 9am. All rescue boat volunteers are required to attend this session for familiarisation with the boats and equipment, as we are installing some GPS units to assist with course laying and to help advise accurate location of the vessel in the event of emergencies. Our PRO for this season, John Chiplin, will be conducting the training. The session will include running through emergency procedures, race procedures and course laying, followed by on-water demonstrations of how to approach and tow skiffs in distress. On water sessions will be prioritised for those not who won’t be available to man the vessels during the racing, those helping out in the afternoon will be caught up before or after the race as time dictates. If you can’t make this session (and let’s face it, surely you can shuffle around your schedule with 4 weeks notice), further sessions will be held during the season. 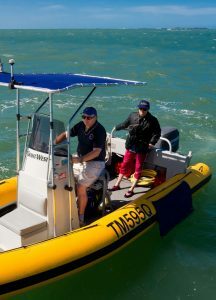 New volunteers coming in during the season will have a shorter induction and will be paired in a rescue boat with a fully inducted person until the next session. This is the one area that really needs a big push, because without adequate rescue boat coverage, racing will not happen. We need people to commit to being available on the water to provide support to our sailors. There’s at least 4 people required on top of our race committee each weekend of sailing, especially at Manly. The good thing about a roster is you don’t have to commit to every weekend, and if we have enough troops it may only be a once a month commitment. We have a couple of major events to support as well, so we will need all club members to get the word out – family, friends, work colleagues, whoever is willing to join in can be a volunteer. If you’re not grinning from ear to ear at the prospect of SAILING about to start, then you’re a potato.